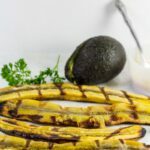 How to grill plantains, my friends! Because plantains are life! Plantains are a staple in Western Africa and Caribbean countries. For those who are not familiar with them, they are larger than bananas and normally not as smooth as bananas. They are loaded with nutrients especially when eaten unripe. But let’s face it: the ripe ones do it for me. 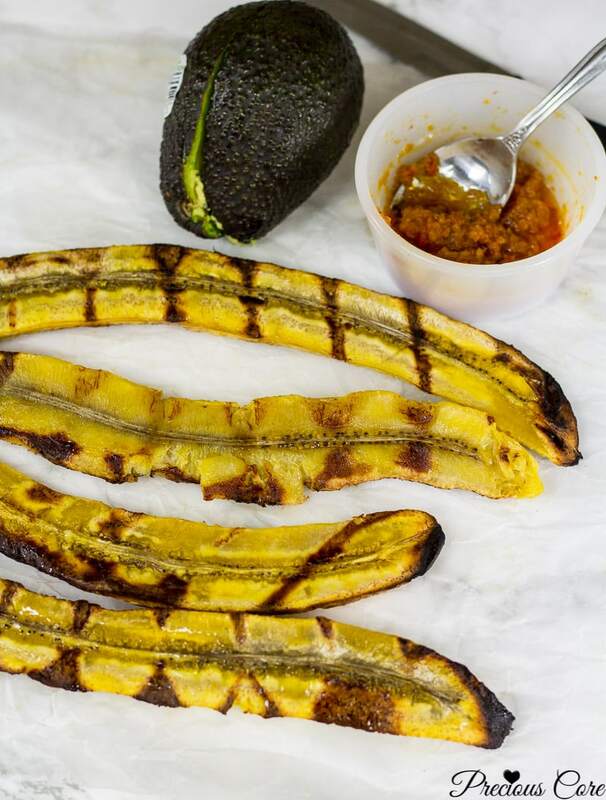 Nothing is as tasty as a well-cooked ripe plantain! It is sweet, soft and so addicting! 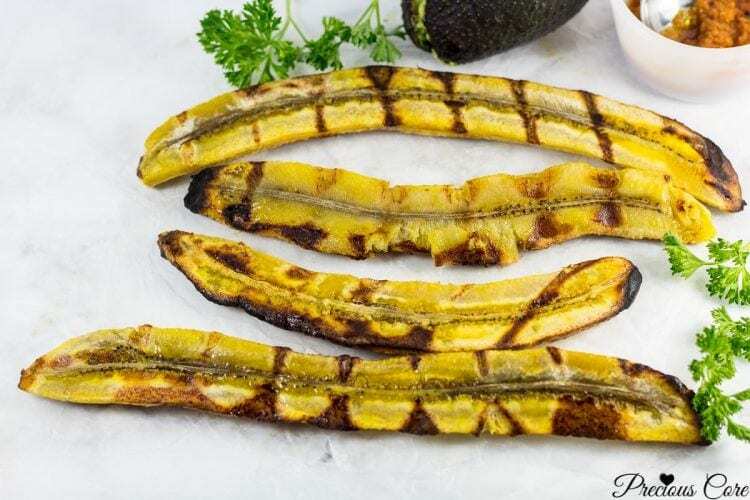 I have lots of plantain recipes here on the blog because I believe plantains are one of the biggest blessings of life. One of my favourite ways to cook plantains is to deep-fry them because someone said history was made when a ripe plantain touched hot oil. I don’t even know who said that but I totally agree with that assertion! I think a deep-fried ripe plantain is life. But my waistline does not think the same thing. So instead of deep frying, I sometimes grill my plantains. Grilled plantains are SO GOOD! I usually devour them with some grilled fish or sometimes just with plain ole’ avocado. 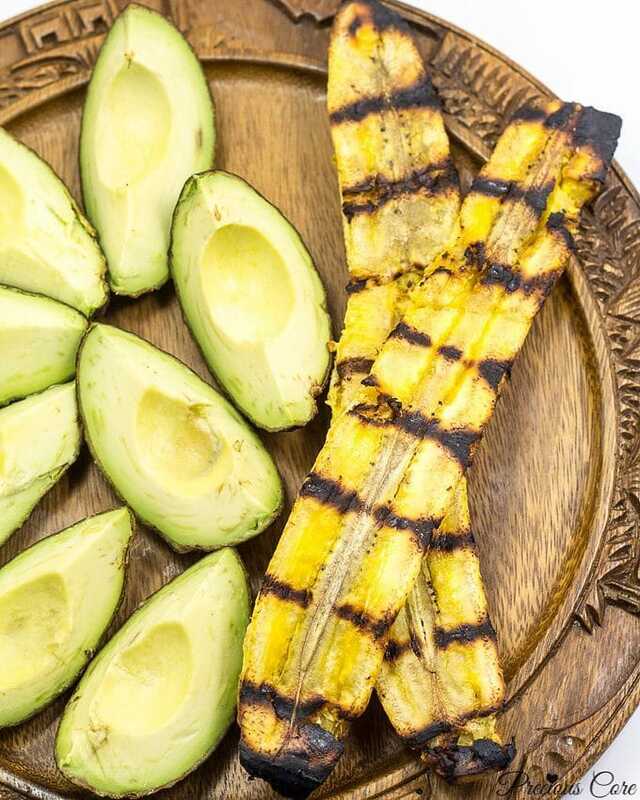 I posted the above photo of grilled plantains and avocado on Facebook a while back and one of you wanted to know how I grill my plantains. 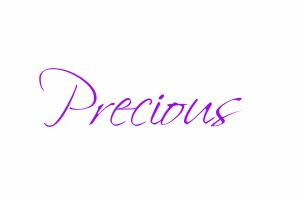 I figured it will be great to share on the blog and I even made a video! 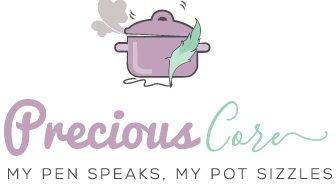 Now, if you would like to be notified each time I post a cooking video be sure to subscribe to my YouTube channel: YouTube.com/preciouskitchen. 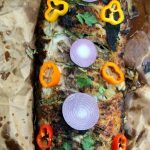 How to grill plantains in an oven! 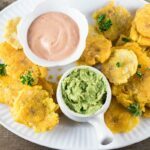 This is a very simple and healthy technique of cooking plantains. Grilled plantains made the perfect side dish for barbecues. Sometimes I just enjoy them with avocado. They are so good! 1. Set oven to grill/broil then brush a grill pan or regular oven tray with oil. 2. Peel plantains then cut through each plantain in the middle from top to bottom. Place the plantains, cut side down on the tray. Place in the oven and let it grill for 20 minutes. Now, halfway through, you may flip the sides of the plantain. However, if your plantains are too soft, you won't be able to flip them so leave them as they are. 3. Serve warm with any side of choice! Options include, grilled meat, chicken or fish, guacamole or even pepper sauce! Enjoy! Looks amazing. I wonder how the avocado tastes with it though. I have to try it sometime. It is so good with avocado, Bisi! Definitely worth trying. Oh yes, plantains have been providing hunger solutions since 19-gboboro lol. 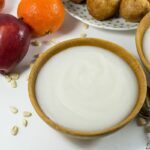 Could have them grilled with omelette, avocado, plums, groundnut soup, roast fish, roast pork, beef or chicken soya….the list is inexhaustive. Pepper sauce accompanying any of the above is an added blessing 🙂 .Thanks for sharing! Oh man! The plantainabilities are endless! I miss ripe plantains and plums so much! That’s a nice combo, Evette! I’m excited to try this – you make it sound delicious. 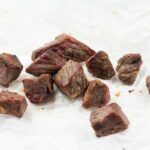 I was just looking for something new to throw on the grill! Hi Bryan, hope you enjoy! Plantains are so tasty.